Zoran Poposki is Finalist in the Global Art Awards 2017 in association with The Wall Street Journal, in the Painting Award category with his artwork X (Vision of Vladimir Ilyich and Two Angels on the Island of San Lazzaro degli Armeni as Recorded by Giovanni Battista Tiepolo). 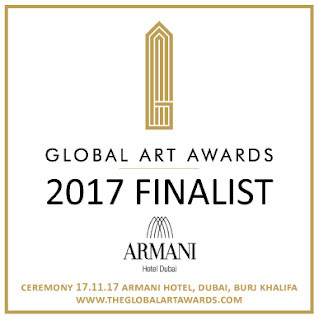 The Global Art Awards, to be presented on 17 November 2017 at the Burj Khalifa, Armani Hotel Dubai - are the international Awards for the Visual Arts. They were created to honor and generate public recognition of the achievements and positive contributions of artists, galleries, and art professionals worldwide. Global Art Awards judges include some of the world's most respected art professionals, art collectors, gallery owners, art critics, art entrepreneurs and local emiratie high profile society, including members of the Middle East Art Collector Association. The Global Art Awards harnesses the insights and talents of more than 10 judges every year. This year the jury includes: Mahmood Bin Karam Al Farsi (UAE, Commercial Director Arab Fashion Council, Manager for Abu Dhabi Media. Jury Member of the UAE Government. Film Producer at Keller Edde Studios, Los Angeles, California), Sophie Neuendorf (USA, Artnet Director, Gallery Network & Partnerships), José Ignació Ruiz Caparrós (China, President at Anacart & Caelis Gallery), Cristoph Noe (Hong Kong, LarrysList / Art Collector Society Contributor at Forbes, Art & Culture), Joobin Bekhrad (Toronto, Award-winning writer, Founder and Editor of REORIENT, Guest Editor of Columbia University’s Columbia Journal), Daryl Goh (Singapore, Founding Curator at NPE Art), Jean Minguet (France, ArtPrice Head Economist & Art Market Analyst), Ghada Kunash (UAE, Founder of The Workshop - Dubai. Art Gallery owner Fann - A' - Porter).